Maybe, it was a strange light, so it could have been a UFO! If you were the leader of an advanced race, would you introduce yourself to other non advanced races? No, not until I kill them all and take over their planet. Yes, to find new friends. Yes, to show them who's boss! If your spaceship crash lands on another planet and the species on that planet is less evolved than you, what would you do? If you were to visit another planet, which resource would you plunder? In the book 'Black Ops, Aliens, Spirits, Bigfoot and our untold History' it talks about a council of different alien races. Would you join the council? Yes, it would be good to join them. If you needed Gold from a planet that had primates living on it, would you genetically modify them so they would be smart enough to be used as slaves? Yes, why not have slaves work for me! If you genetically modified a race so they now are smarter, would you pretend you are a God to them? In the book 'Black Ops, Aliens, Spirits, Bigfoot and our untold History', it explains that the Bigfoot we have on Earth originally crashed here thousands of years ago and were prisoners from their own planet. Would you have rescued them? If you knew about a planet with primitive humans on it and you were told by another Alien race that there were bad aliens manipulating them - what would you do, despite being warned off because of the bad aliens? How interested are you in aliens? What would you do if you see a snail in the middle of a path? Do you believe Earth has been visited by aliens? Who do you think built the pyramids? What trait would you want if you were an advanced alien race? Small grey coloured aliens from the Orion constellation. They are workers for the tall whites and a few other races. They are 'programmed' to do tasks, they have computer type chips inserted when they were being cloned. Share this quiz to find out what your friends really are! The 8ft tall Anunnaki are a race that live on the planet Nibiru and they came to Earth about 450,000 years ago. They genitically modified the primative bipeadal species and created modern man. They pretended they were Gods and at first used the modern humans as slaves. These small aliens look like the Orion greys and are sometimes classed as being bad when they are not. The Zetas were the ones that crashed in Roswell 1947. They are peaceful and are trying to help humans see that they are being manipulated by other races. There are a few different types of reptillian races, they are not here to help humans. One of the oldest races out there, although they are involved in abductions, they are not bad. They believe humans have the power to be good and they are loving towards humans. They have also been called Nordic aliens because of the blonde hair and blue eyes. The men and women are all picture perfect and look like super models. They want humanity to become enlightened like they are. You might think that Bigfoot is earth based, he is, but his race is originally from another planet. The ones on earth crashed here thousands of years ago. The Bigfoot as a race are like humans, some good and some bad. Said to be one of the most advanced civilizations in this galaxy. They may originate from another galaxy. It's claimed they have been defending Earth from some of the bad alien races for a long time. There are at least 30 known alien species that have been seen visiting Earth. Each of these races have different traits. 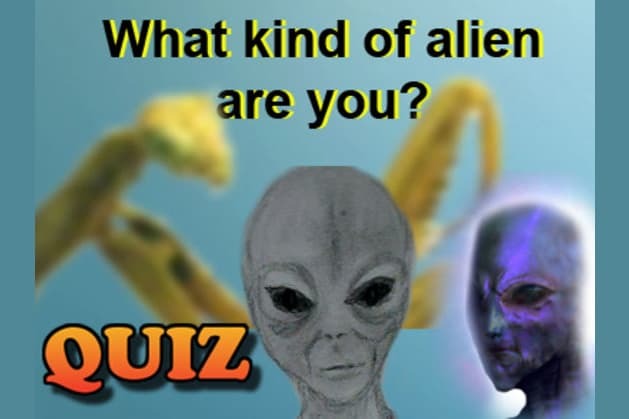 Take the quiz to find out what Alien race you are closest to, then ask your friends to do the same. Be warned they might not be what you except them to be! Information for this quiz comes from the new book 'Black Ops, Aliens, Spirits, Bigfoot and our untold History' available on Amazon, Kindle and Kindle unlimited.